I finally got my hands on the new beacon from Backcountry Access – the three antennae Tracker2. The initial chatter was that these would be available last season, but in true BCA style, they were only 99% happy with the product at that time and insisted on waiting until they were 110% happy to release it. It was worth the wait. I unpackaged mine just in time for a long holiday weekend down on Red Mountain Pass – where they had received more than 14 inches fresh powder on New Year’s Eve! BCA's goal with the Tracker2 (as with the original) was to make it first and foremost extremely user friendly. After using the original Tracker, I didn't think they could make a beacon any simpler to use. They did. There are three features that make the Tracker2 even easier than original: 1) The big yellow button that switched between search and transmit modes has been replaced with a mechanical pull tab. The yellow button was fairly easy to understand, but I saw students in L1 courses struggle with it, especially when the winds were nuking and the big expedition mitts made it difficult to actually feel the button. The pull tab is money. You can operate it with full gloves on in -22C weather (as I did last weekend). There is no question as to which mode you're in. 2) When teaching students to first use a beacon, one concept that is often lost in the process is that when you conduct a fine search (within 3 meters of the target) you have to ignore the directional arrows. BCA recognized this and the Tracker2 is programmed to turn off those directional arrows when you get within 3 meters. No more confusion. 3) The Tracker2 is FAST! Fast enough to deserve some flames or a lightning bolt decal. BCA advertises the Tracker2 as the only real-time beacon (says so right on the box). Being the skeptic that I am, I figured it would be an improvement on the original, but real-time? I'm here to tell you to believe the hype – the new processor and algorithm will move faster than you ever will, and blows the competition out of the powder. What about the third antennae, you ask? The third antennae (along with the processor and signal processing algorithm) enables the Tracker2 to be incredibly accurate while bracketing, even for deep burials. 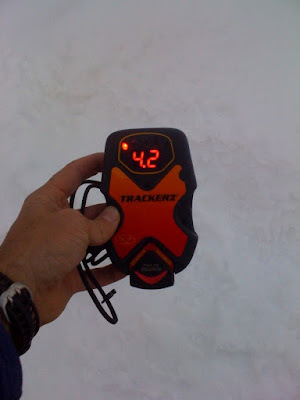 Given that the average avalanche burial depth requiring use of a beacon to find the person is 1.2 meters (which translates to shoveling more than a ton of snow), you want to be as accurate as possible with the fine beacon search. I wanted to test this feature, but given our current shallow snowpack, and the arctic temps, I opted to evaluate it indoors. So I set a transmitting beacon on the floor under the kitchen table and hopped on top of the table with the Tracker2 in search mode. After conducting the fine search, the lowest reading on the beacon was 1.5, and was located perfectly plumb line above the transmitting unit. For more info about the Tracker2, check out BCA's website. Want to improve your knowledge of avalanche hazard, gain confidence in decision making in the mountains, and get hands on training in companion rescue? Join CMS for a L1 Avalanche Course or a day of guided backcountry skiing this winter. I used the original Tracker in my AIARE course and I was very impressed. There is no doubt BCA makes a great beacon! I am looking forward to taking a look at the Tracker 2 at the end of the month. However as you know the beacon will get you to the burial, the gear will get you to the victim, however knowledge is needed to do all of this.....an avalanche course is very important. If you are looking to pick up some backcountry gear or avalanche safety equipment please check us out at www.myallmountainaccess.com. It always good to have such tracking device so that it easier and time saving while going for skiing. I think you're right, because it's all about products and its features, actually you must add more pictures about it to make a difference with the mechanical pull. I think that you should add in your review. What this thing does. Because there are people that they don't know and you can help them tool.